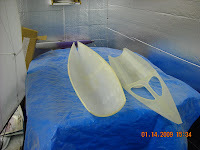 Here are the hull and deck that was laid up from a mold. The hull that I ended up with was found to be a bit light and therefore not so stiff. We decided to add a few layers of glass to the inside of the hull to stiffen it up and to prevent flexing.